Welcome to the Mathematics & Economics: Connections For Life web site. This web site was designed to help support the usage of the Grades 9-12, Grades 6-8, and Grades 3-5 materials in the classroom. Mathematics and economics naturally complement each other. In today's era of interdisciplinary studies, this new curriculum - created especially for mathematics teachers - hits the educational target by showing how mathematics processes and concepts can be used to develop economics and personal financial knowledge. Mathematics teachers do not need to have a background in economics in order to implement the curriculum. 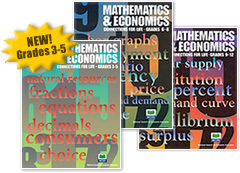 Each lesson contains student activities, overhead transparencies, and background information on the economic content and how it relates to mathematics. Extension activities where students can apply their mathematics and economics knowledge to other situations are also provided. The Council for Economic Education's Mathematics & Economics Program is generously sponsored by State Farm® and 3M.